Here I am again with a card this time! Yay!!! 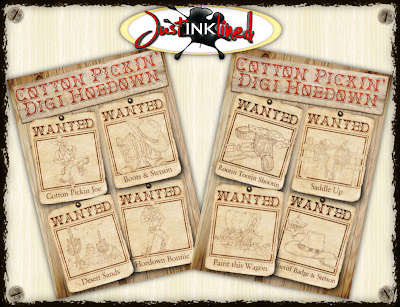 This is for the Hoedown at Just Inklined! Have you heard about their brand new wild Western digital stamps? Just Inklined. I used a blank ticket to which I added my own text. The base card is Kraft to which I added a matt of checked card. We all know it's hot out there in the desert & things get burned, right? My image was no exception! who it's by!All I can tell you about it is that it's travel related! all been in my stash for ages! I'm trying to use lots of stuff up to make room for some new supplies! Thanks for stopping by! I always enjoy your visits! Great card, Dawn. Love the colouring and the burnt edges...but I know I'm not that brave! A fabulous card for a guy Dawn! Love the design and the gorgeous embellishments. Love how you have burnt the edges of your picture too it looks fabulous. Fab card Dawn, I love how you've used brads as studs on the faux leather hun. Fabulous - love how you've coloured - especially the sky! Absolutely fantastic! Love your beautiful coloring and the brass buttons! beautiful card and love your colouring. thank you for joining us at Sweet Pea Stampers this month and hope we see you again.. I can feel the heat from here. fabulous card Dawn. Great card love all the details you added thanks for joining us at Incy Wincy this week. Fabulous card Dawn!!!! Your coloring is beautiful. Thank you for joining us at Whimsy Stamps! Fabulous card Dawn!!! Your coloring is beautiful! Thank you for joining us at Whimsy Stamps. Beautiful card the image is simply striking. Thanks for joining in on the fun at Tuesday Throwdown. We look forward to seeing you again. Great use of all those brads! Thanks for playing along at Use It Tuesday! Wonderful Western card. Super details and that landscape is colored fabulously! Hugz! Wow! Love the image on this. Thanks for digging into your stash and playing along with us at UIT! What a great use of the brads. Thank you for joining us at Use it Tuesday! Heads Up On A Fab Bargain!